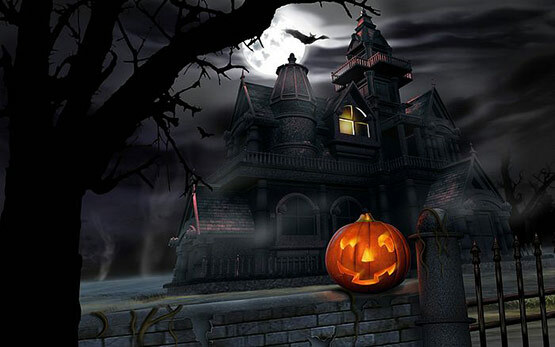 PREPARATIONS FOR HALLOWEEN AT ALLAN BANK. Ranger Team Day at Millerground. As mentioned in previous posts, sections of the Millerground footpath... on the extremely popular woodland walk along Windermere's eastern shore...are at risk of being seriously undermined when lake levels rise. To combat this...stone revetment work by rangers and volunteers has been taking place in vulnerable areas. 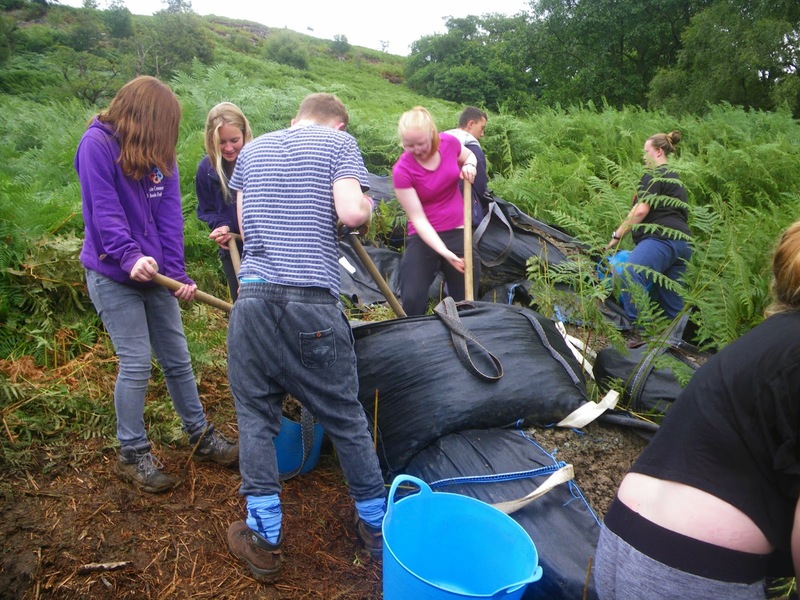 It was felt that one bad area in particular needed many hands to help make a big task a lot less daunting; so Rangers, based at St. Catherine's Windermere, arranged a "Team Day" with the Fell Rangers, Rangers from Langdale and from Ullswater to assist with the work. 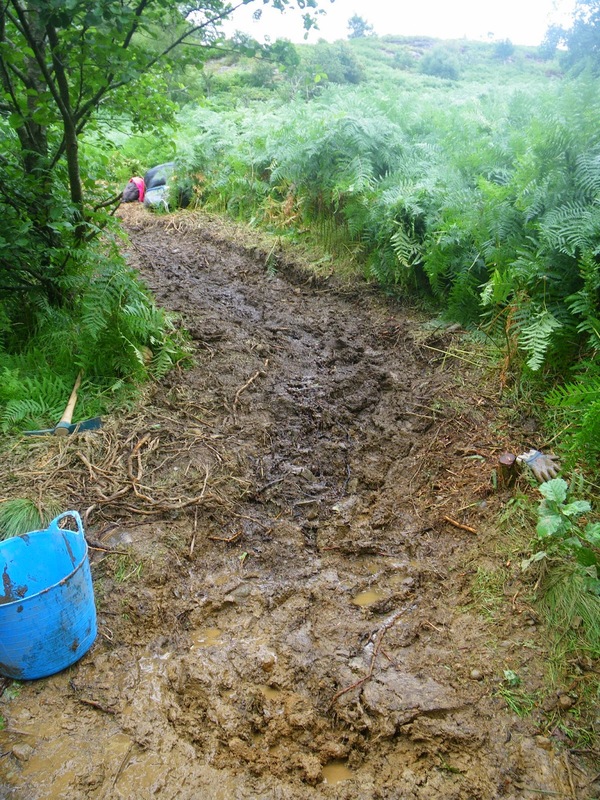 It can be seen how the ground has sagged, the bank having been undercut and the soft sub soil washed away. A small sycamore, that had collapsed along with the undercut bank, needed to be felled and removed prior to continuing the stone revetment work. 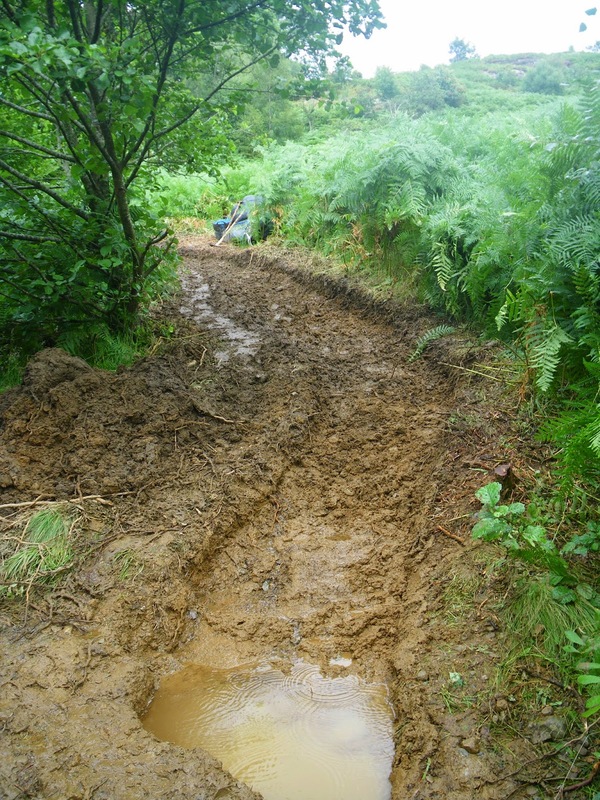 Revetment work proceeding with Fell Rangers, Leo and Ade and Langdale Ranger, Laura. Stone and rubble in the right of the image is being used to fill a void created by a fallen beech tree. The cavity that was created behind the uplifted rootplate after the tree fell is very close to the footpath, hence the guard fence. Once the hole was filled and levelled the fence could be removed. Stone being brought in by power barrow by Dave, Ullswater Ranger, and Ray, Windermere Ranger. Many tons of stone were needed. These power barrows have proven to be invaluable on difficult sites. Pitching up the slope where the sycamore once was. Another section of path made safe. The angle of the revetment is designed to dissipate the strength of the waves when water levels are high. Putting in the new path edging stones. Where did you get that hat!? Newly landscaped area above the fallen beech tree. It is healthy enough inspite of its prone position as it still has a good root system. Interestingly reed beds are becoming established in the shelter of this fallen tree! What kind of a Team Day would it be without a barbeque? Steve from Ullswater keeping an expert eye on the sausages and burgers. "Apple Day" at Acorn Bank, Temple Sowerby is an annual event that began in 1994. Over the years its popularity has grown to the extent that yesterday, Sunday the 12th of October, more than 2,500 people came along to enjoy all that Apple Day has to offer! Acorn Bank and South East Lakes and Morecambe Bay staff put on and run the event with assistance from National Trust properties throughout the North West. Staff from Central and East Lakes were involved mainly with marshalling the car parking and running the Apple Shy. This was a view from Kirkstone Pass on the way to Acorn Bank on Sunday morning. Looked like a glorious day was on the way! A big area of parkland, but it soon filled up with cars. LOTS OF ACTIVITIES ON THE DAY. Bill and Abigail, National Trust Recruiters, Central and East Lakes. More images from Apple Day. Spectacular temperature inversions are particularly likely to form over valleys with large bodies of water. The image below, taken at 8 a.m on October 2nd from St. Catherine's, shows a temperature/cloud inversion over Windermere, England's largest lake. These inversions usually occur on still, quiet nights prompting cold dense air to sink down, displacing warmer less dense air, hence the term..inversion. The effect of the surface cooling down produces condensation in the air above and low clouds form. A closer view of the cloud cover above the lake, still trapped by the warmer air above that acts like a lid! Long cold and still nights not only cause temperature inversions, they are also ideal for the formation of ground frosts. By 8.15 a.m heat from the rising Sun and a strengthening breeze has dispersed most of the low cloud and the ground frost has all but gone. This image, taken at 8.30 a.m from the Grove Farm near Common Wood, shows the last traces of the inversion over Windermere below Claife Heights. This image, taken at 1 pm, is an attempt to show how clear the air is after the inversion has lifted. Perhaps a better camera was needed to show the breathtaking clarity of the Langdale Pikes, but hopefully this will give some indication! Inversions and ground frosts typically occur in Autumn; the exceptional "Indian Summer" enjoyed by so many in the Lake District must be nearly over! 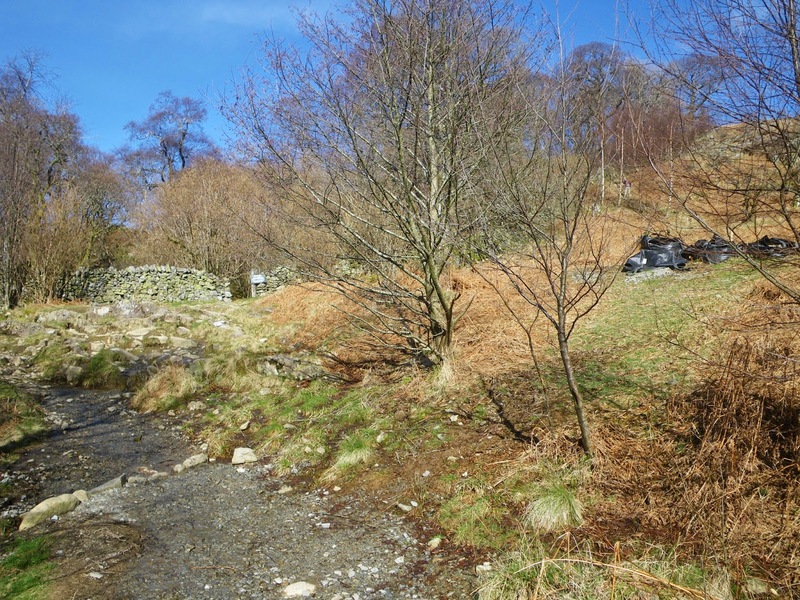 During the summer the Rangers at Ullswater have been carrying on path improvement works throughout Aira Force. There was a particularly bad section of path at High Force that needed some remedial work undertaking on it. This picture shows the old path leading up the left hand side to a very rocky and eroded section. The grass and soil have gradually been washed away over the years, which has exposed the bed rock, this has become extremely hard to walk on, in turn this leads to people walking on the edges of the path, these edges eventually erode away and expose more bed rock, which over a number of years leads to the path increasing in width. The plan was to re direct the path up to the right, avoiding the bed rock. The idea was to dig a meter wide channel into the soil and then lay some gravel down to provide a hard surface to walk on. This sort of work is extremely labour intensive, so it was very useful to be able to work in partnership with the Outward Bound Trust. On four separate occasions we where joined by groups of young adults. The first three days we where joined by a mix of European and UK students, who where on a three week course, learning different life skills. 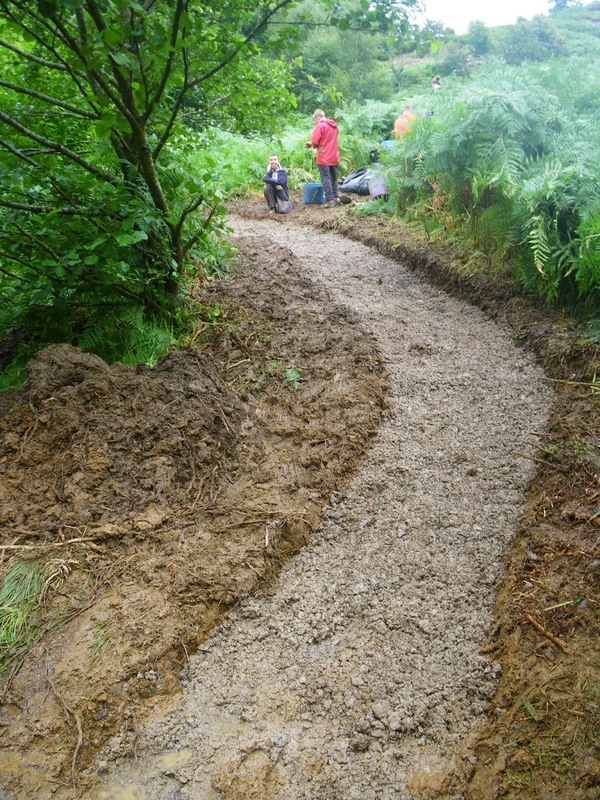 They all worked extremely hard and at the end of the three days the new path had been dug and filled with gravel. 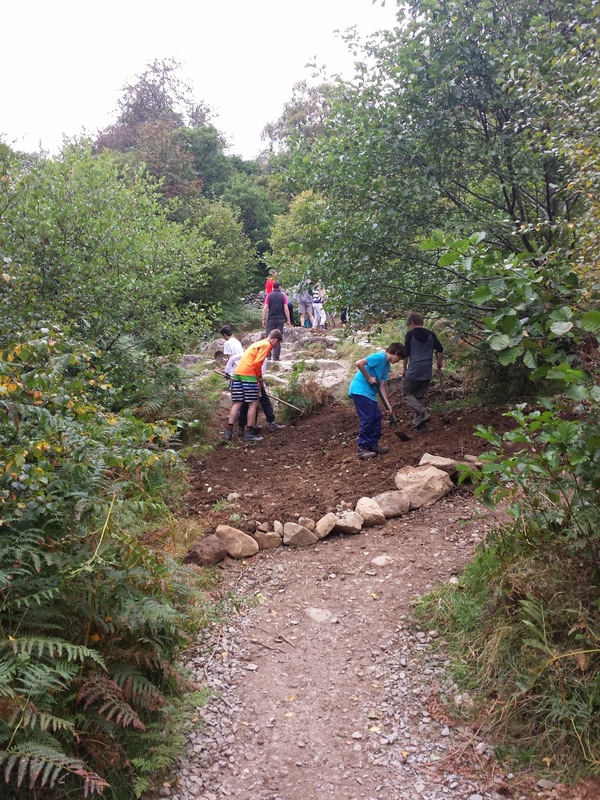 On the fourth day we where joined by a younger group of students, this time the plan was to landscape the old path in so that people weren’t inclined to still use it. Soil that had been dug up was used to cover the old path, and stones where dug in so as to deter people from following the old root. Grass seed was then spread over the soil, so hopefully by next spring/summer the old path will no longer be visible. Thanks again must go to the hard work all the students put in over the four days. A job that could have taken a couple of weeks to complete was finished in half the time.